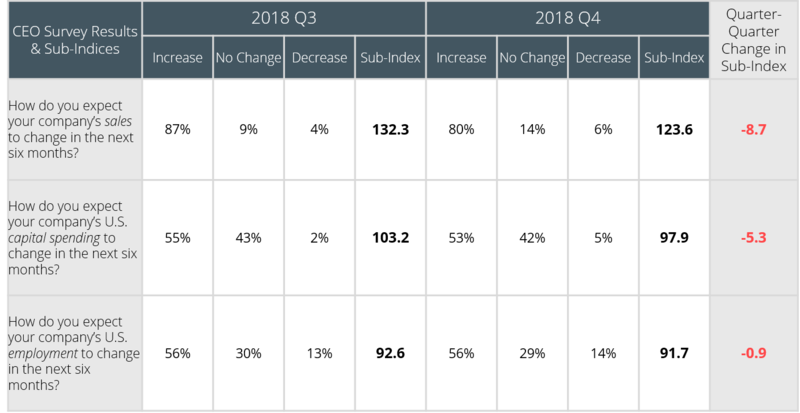 Business Roundtable today released its Q4 2018 CEO Economic Outlook Index – a composite of CEO expectations for sales and plans for capital spending and hiring over the next six months. The Index remained at a historically high value, reflecting a strong CEO outlook for the U.S. economy. However, Q4 marks the third consecutive quarter in which the Index declined from the previous quarter, reinforcing the importance of removing barriers to trade, including tariffs, and continuing to advance domestic policies to stimulate hiring, capital investment and economic growth. CEO plans for hiring dipped 0.9 points to 91.7, which is the fourth-highest value for the employment sub-index in the Survey’s history. Notably, all four of the highest values occurred in 2018. Plans for capital investment fell 5.3 points to 97.9, which ranks among the top 10 highest values for the capital spending sub-index in the Survey’s history. Expectations for sales decreased 8.7 points to 123.6, which ranks historically in the top third of all readings of the sales sub-index. In the first special question, which is asked in every fourth quarter survey, CEOs identified the greatest cost pressure facing his or her company. In four of the last six years, regulatory costs were ranked highest by CEOs. In the Q4 2018 Survey, just 13 percent of CEOs selected regulatory costs as the greatest cost pressure, a drop of roughly two-thirds since Q4 of 2016 when 40 percent of CEOs provided this response. The top cost pressure CEOs identified in this Survey was labor costs (37 percent) followed by materials costs (20 percent), likely reflecting a tight U.S. labor market and higher costs from U.S. tariff increases. The fourth quarter 2018 survey was conducted between November 6 and November 26, 2018. Overall, 141 CEOs completed the survey.